Our Logo Products . . . Recognize other SD members by displaying or wearing. "Guys thank you for the cool looking sportsmens decal for my truck. I get comments on it all the time"
"I got3 of your packages and have given them out to other men at my church and they really liked the hat and decal. They are members of SD. They put the decal on their trucks and wear the hat all the time. Thank you for publishing the devotional. It really makes a difference!" Everyone looks and asks about my Sportsmens D. hat. It opens the door to talk to them about you all and the Lord! Thank you Sportsmens D! I love my Sportsmen's hat and I need to order another because its getting worn out. Thank you men and ladies at Sportsmen's Devotional. Three decals to choose - Fisherman/elk, Bowhunter/elk, or Bowhunter/whitetail. Includes hat, SD cards, & decal. Embroidered on black, camo trim. 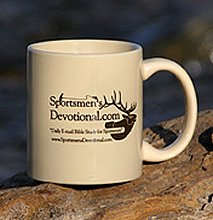 "I notice other Sportsmens Devotional Decals now here in TN and even had a chance to talk to a guy the other day that had a Sportsmen's Devotional decal on his truck. We are planning a hunting trip together now and I have made a new friend. Just wanted you all to know. Keep up your valuable work. We sure appreciate it!" "I won a devotional hat at a game dinner and it is my favorite hat because of all the hats I own its the coolest looking. It also has a great message. I found out about you all at the dinner and have been disciple by your writers ever since. Thank you for the difference you all have made in my life. 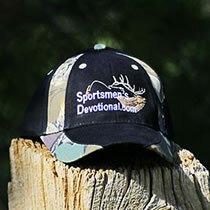 I just ordered a sportsmens devotional decal for my truck. Thank you again for the hat! " "Sure appreciate you all at SD! I wear my hat proudly. Everyone as ks.. What's that all about?" "I love my decal on my truck. I'm getting another for our car. Thank you to Sportsmens D! " Thank you for supporting our wild game dinner again this year. The banner always helps and your give away's were perfect. Thank you for all you do!" Thanks for sending us materials for our big event. We gave away a ton of your cards! Everyone loved the car decals and hats. Thanks and glad to support you back. This is a popular item for the back of vehicles. High quality long lasting vinyl and a cool looking logo. Can be applied to store glass windows also. Size 4 1/2 x 11 1/2 in. Used for outreaches and events. Items are intended to be given away. Please allow 2 to 3 weeks for delivery. By supporting us we are able to pay our monthly bills and keep this service growing as well as support others. Thank you for your support!